Existing home sales decreased 3.2% in October, but were up 6.0% from the same period a year ago. The National Association of Realtors (NAR) reported October 2013 total existing home sales at a seasonally adjusted rate of 5.12 million units combined for single-family homes, townhomes, condominiums and co-ops, down from a revised September level of 5.29 million units. All regions declined from September levels, and the West had the largest decrease at 7.1%. The West was the only region that was also down from the same period a year ago, with a slight 0.8% decrease. The Northeast was up 11.7% from a year ago, followed by the Midwest which was up 8.0% from last October and the South which was up 7.3% from the same month a year ago. The October 2013 level of single-family existing sales fell 4.1% from September to a seasonally adjusted 4.49 million sales, but was up 5.2% from the same month a year ago. Seasonally adjusted condominium and co-op sales were up 3.3% in October to a seasonally adjusted 630,000 units, and were up 12.5% from the same period a year ago. 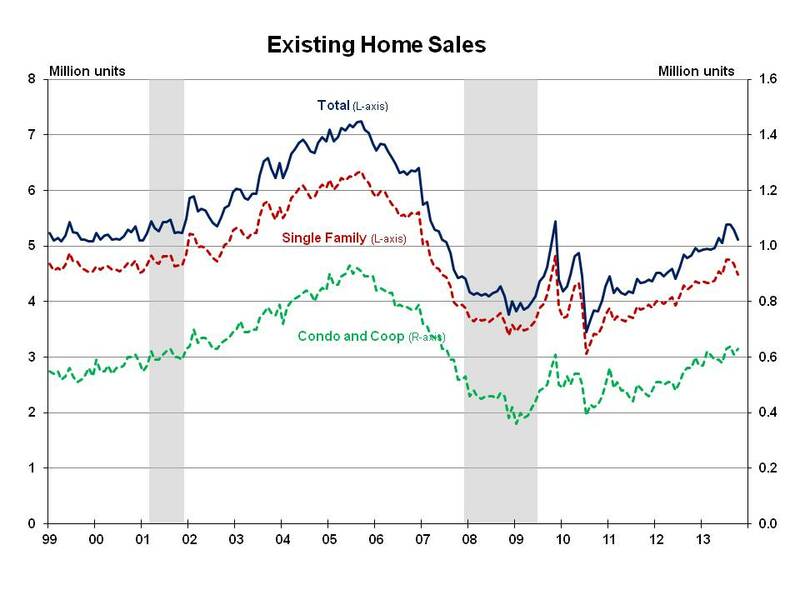 Due to seasonal declines, the total housing inventory decreased 1.8% in October to 2.13 million existing homes. At the current sales rate, the October 2013 inventory represents a 5.0-month supply compared to a 4.9-month supply in September, and a 5.2-month supply of homes a year ago. NAR also reported that the October median time on market for all homes was 54 days, up from 50 days in September but down from 71 days during the same month a year ago. NAR reported that 36% of all homes sold in October were on the market less than a month, marking a slower pace from 39% in September. The share of distressed sales held steady at 14% in October, compared to 25% for the same period a year ago. Distressed sales are defined as foreclosures and short sales sold at deep discounts. The median sales price for existing homes of all types was $199,500 in October, up slightly for the first time in four months from a revised $198,500 in September. The October median sales price was up 12.8% from the same period a year ago. Compared to a year ago, median sales prices increased 17.2% in the West, 12.9% in the South, 9.3% in the Midwest and 7.4% in the Northeast. The median condominium/co-op price increased slightly to $199,200 in October from a revised $198,800 in September, and was up 13.1% from the same period a year ago. In October 2013, all cash sales were 31% of transactions compared to 33% in September, and 29% in October 2012. Investors accounted for 19% of October 2013 home sales, the same as the previous month and down from 20% during the same month a year ago. First-time buyers accounted for 28% of October 2013 sales, unchanged from September, but down from 31% during October a year ago and well below the historical average of about 40%. NAR chief economist Lawrence Yun observed the decrease in the inventory level, and asserted: “More new home construction is needed to help relieve the inventory pressure and moderate price gains.” NAR also suggested that the decrease in the distressed sale share contributed to the increase in the median price. Monday’s NAHB/ Wells Fargo Housing Market Index remained above 50 which was encouraging given the policy and economic uncertainties potential buyers faced last month and must continue to consider. The 3.2% decline in October sales is consistent with last month’s 5.6% decrease in the Pending Home Sales Index. After a brief surge in sales in the spring and summer, ensuing policy uncertainties and rising interest rates have dampened sales. After a period of adjustment over the next few months, the long-term trend of increasing sales will continue.